In addition to the traditional areas of theory and experiment, numeric simulation tools are now becoming into a third instrument for use in scientific research. As the complexity of interrelationships - for example in meteorology, genome research, and the interaction of individual molecules - cannot always be duplicated in experimental set-ups, modern scientific research is increasingly resorting to the simulation techniques used in information technology and mathematics. The advancement of these is the main interest of the research focus "Computational Sciences in Mainz (CMS)". For complex systems in particular, an adapted formulation of the problem posed, the design of suitable approximations and algorithms as well as the development and execution of matching high-performance computer architecture are of major importance. Added to this is the problem of dealing with large and what are at first often unstructured quantities of data and the difficulties of visualization and interpretation of the results achieved. The aim of this research focus is therefore to foster corresponding projects that link information technology and mathematics on the one hand and physics, chemistry, geosciences and biology on the other. 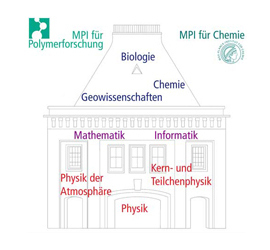 By means of simulations for the theoretical interpretation of experimental results, the scientists at Johannes Gutenberg University Mainz and the Max Planck Institutes for Chemistry and for Polymer Research are thus making a significant contribution in the area of computer-based research. Given the rapid scientific advances in this field, methodological enhancement of the simulation technology are undoubtedly required, which makes collaboration with information technologists and numerical mathematicians all the more necessary if supercomputer architecture like that at Jülich is be used productively. It is only through this interdisciplinary collaboration that the working groups in Mainz will be able to hold on to their leading position in this field. The subjects being investigated within the computer-based research focus derive from nuclear and particle physics, chemistry and the theory of condensed matter, genome research and population biology, meteorology and earth system sciences. Scientists are benefiting from computer-based processes in, for example, climate research (the physics of cloud formation), earthquake prediction (the behaviour of silicates subjected to high pressure), and the development of new synthetic materials (modelling of synthetic polymers). Furthermore, the focus is being placed on fundamental aspects of numeric simulations and the further scientific development of software and hardware, which are the subject of research in mathematics and information technology.